The recent Frontline documentary Alaska Gold chronicles many heroic and inspiring stories in the struggle to save Bristol Bay and its wild watershed from a mega copper mine. We provide a link to another one below. Bristol Bay serves as a reminder that the job of protecting our own wild salmon river from mining is far from done. 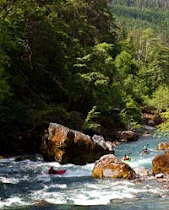 The Chetco River Protection Act has not been passed into law and the Forest Service's proposed temporary mineral withdraw still faces many hurdles before it's even decided on by the Secretary of Interior. If these efforts fail, we could once again be faced with proposals to mine the entire length of the Chetco—from Boulder Creek to the Forest Service boundary. Please go to How to Help and send a reminder to Senators Ron Wyden and Jeff Merkley that we need their help. Go ahead. 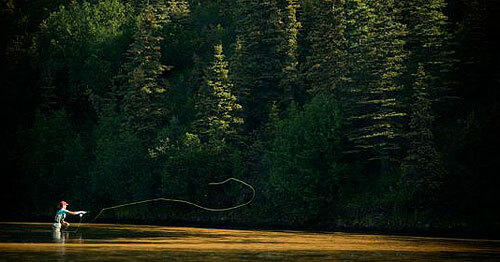 Please nag the Senators for the Chetco and read about "salmon ecology 101" and what others are doing below. 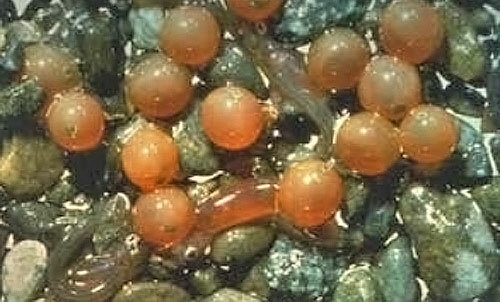 Recently hatched salmon and salmon eggs from Pebble Science's Salmon Ecology 101. If you missed it on PBS, you can watch Frontline's Alaska Gold in full online. Frontline's website contains other resources of interest too. Go to Alaska Gold. The documentary is about great salmon watersheds, how they work and people coming together to protect one of the world's greatest salmon runs. It equally presents the multinational mining company's arguments to develop a mega mine in the watershed. The footage is excellent. The film inspiring. Highly recommended. Photo courtesy of Felt Soul's Red Gold website. See the Red Gold trailer below. Here on the Wild Rivers Coast we are blessed with the most beautiful productive, undammed salmon rivers between the Olympics and Baja. 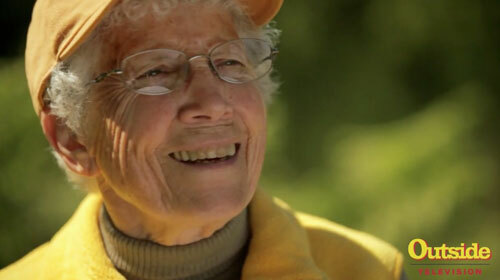 As river lovers like Phyllis Clausen celebrate the removal of dams on their rivers, it should be a reminder to celebrate and take care of our free flowing rivers—the Elk, Chetco, Illinois and Smith River—and their wild watersheds. Phyllis Clausen celebrates the removal of the Condit Dam on the White Salmon River. Below are two powerful short videos about dam removal—one the trailer for DamNation, a new documentary by Felt Soul on dam removal and the other Andy Maser's short film for Outside Magazine on the spectacular removal of the Condit Dam on the White Salmon River.